The Africa supplement for the Force on Force rules arrived yesterday, entitled Bush Wars it contains a mix of background info, scenarios, Orbats and painting tips. Given that it has plopped through my letter box yesterday it seems an appropriate time to review my plans for gaming Africa. My main theatre I want to game is Rhodesia 1965-79. I got a lot of the Selous Scouts and Rhodesian Light infantry from Bill at Under Fire Miniatures- lovely figures too. I’ve got enough of them painted now to do a decent sized game. 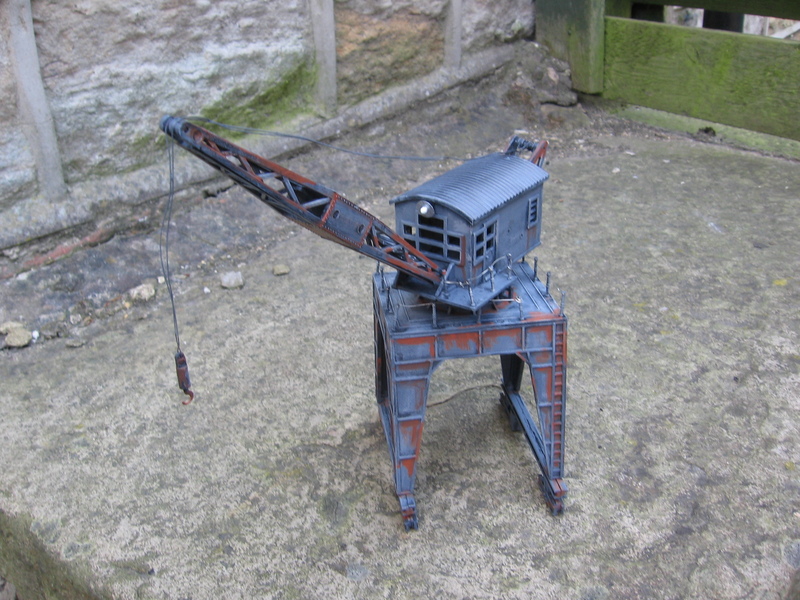 I picked up and Alouette III chopper from ebay that needs building up for them. Ideally I’d like a second so I can have on each of transport and gunship versions (G cars and K cars), also a Huey D would come in handy. As for ground vehicles it’s a shame no-one makes any of Rhodesia’s icon mine protected vehicles other than S and S ‘s Crocodile truck. Additionally a couple of Ferrets and Elend Armoured Cars would be good. For the opposition I’ve collected a reinforced platoon sized group of irregulars who will play the part of ZANLA. Also I’m slowly acquiring a similar group of African’s in more regular dress for a ZIPRA force. It is also my plan to use these two platoons as generic forces for the whole continent. Second to Rhodesia I’m interested in the South African bush war. I’ve got loads of the Liberation Miniatures figures for the period but sadly none of the Ratels, Casspirs of Buffels that characterize the Mechanized infantry. Liberation do Ratels as do S and S, who have just released a Casspir. 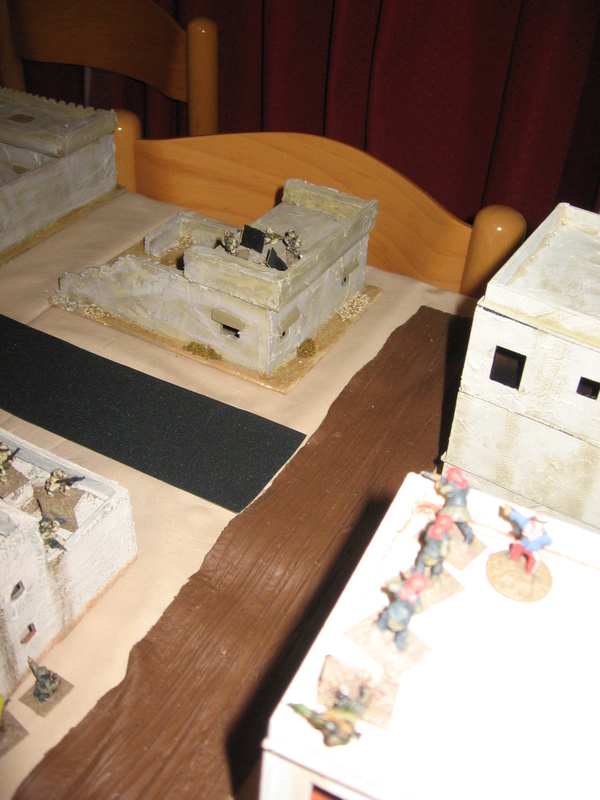 Again the two generic platoons will provide the opposition, although there is the temptation to add some Cubans too. 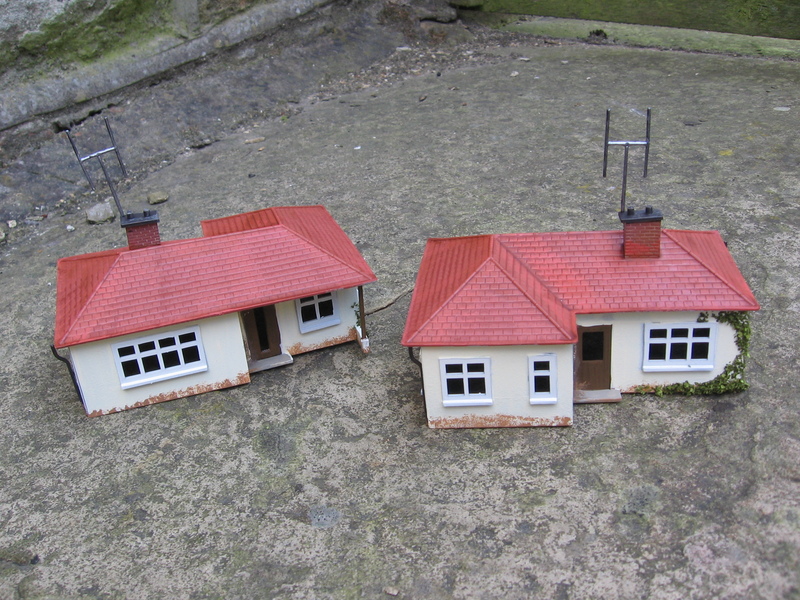 As for scenery I’ve got a small shanty village, a few tin roofed buildings finished ; a rural mud hutted village is about half completed. These mixed in with my existing hills and trees should provide a suitable gaming board. 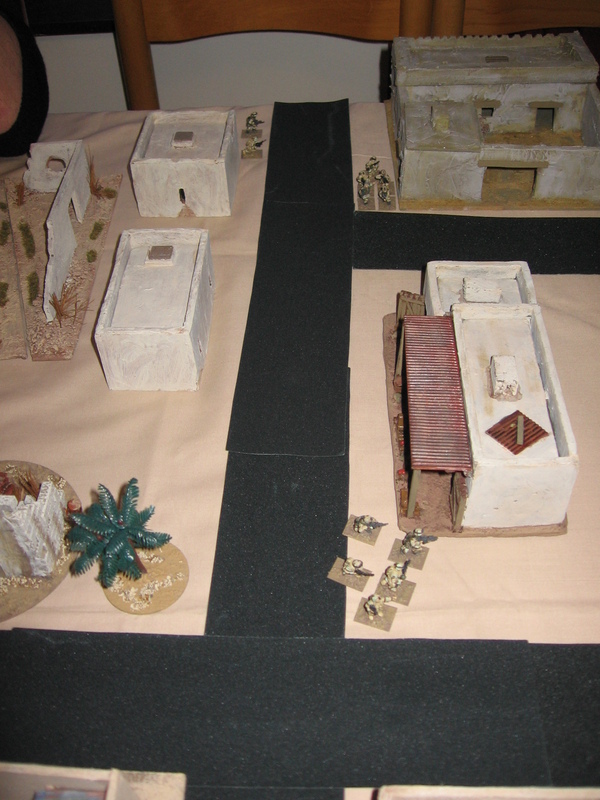 If I mix my existing middle eastern houses, the shanties, the generic irregular platoon and my desert US figures I should be able to do a decent set up for Mogadishu too- well that’s the plan anyway…. I’ve not had chance to fully read the Bush Wars supplement but having a good flick through has left me impressed. Covering the Congo and Portuguese experience, two areas I’m not up to speed on, it moves on to Rhodesia (5 scenarios) and the South African Bush war (7 scenarios), finally ending with Operation Barras in 2000. I was glad to see it didn’t cover the whole imagi-nation side of modern African gaming, the cartoony approach that it often entails leaves me a bit cold. 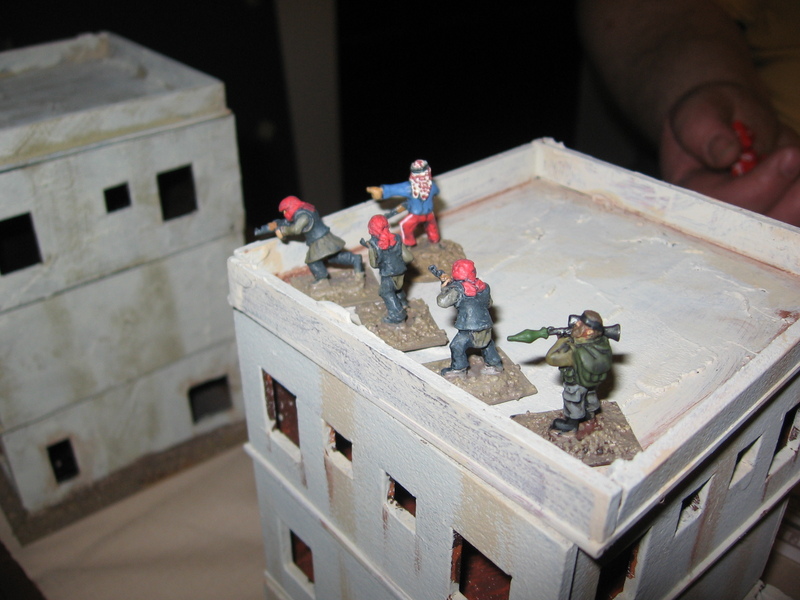 I’ve had the need for some suitable buildings for my modern games- both Zombies and those favourite ‘cold war goes hot’ scenarios. 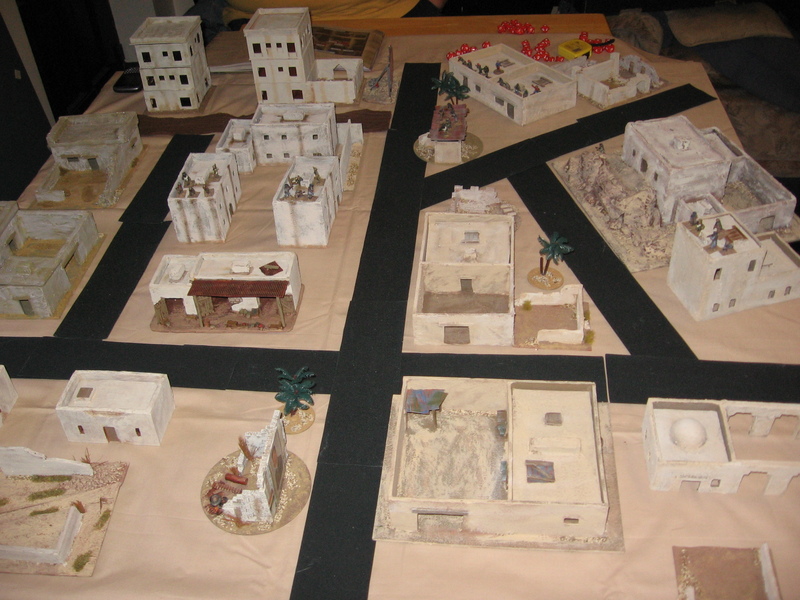 Whilst I have boxes of terrain the vast majority of the buildings are in ruins and are not quite suitable for my needs. 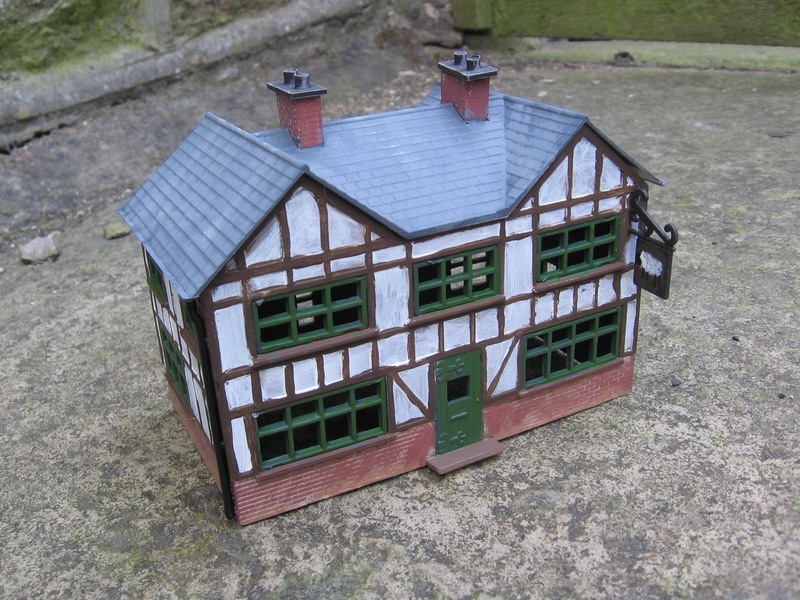 I decided to go back to basics an order some of the (very) old Airfix building now marketed by Dapol. 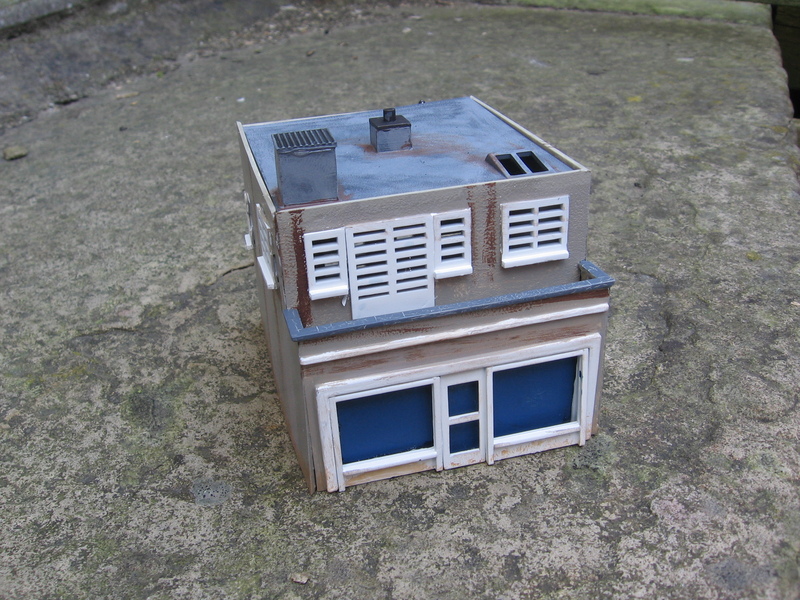 Here are the results – which will also count as my entry in the Guild forum’s group build. 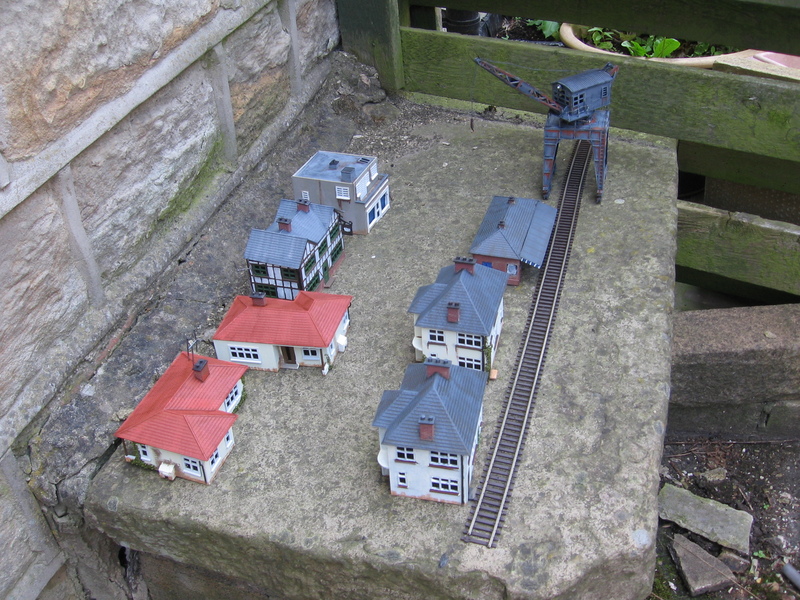 … a small train station…. 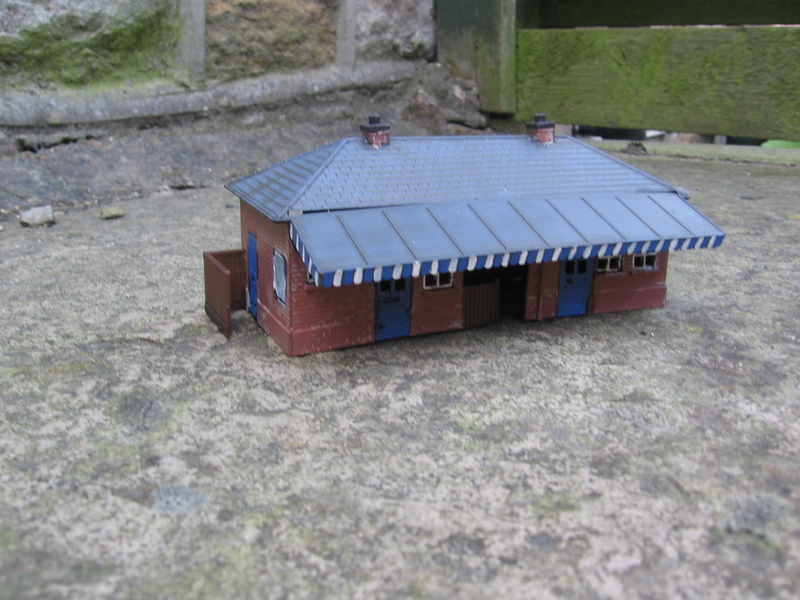 … and finally a small shop. I spent the weekend at the Triples Show in Sheffield ( helping Bill with his lifting and carrying at the Under Fire Miniatures stand). Triples has always been my favourite show- good selection of both traders and games. I picked up a few bits and pieces. 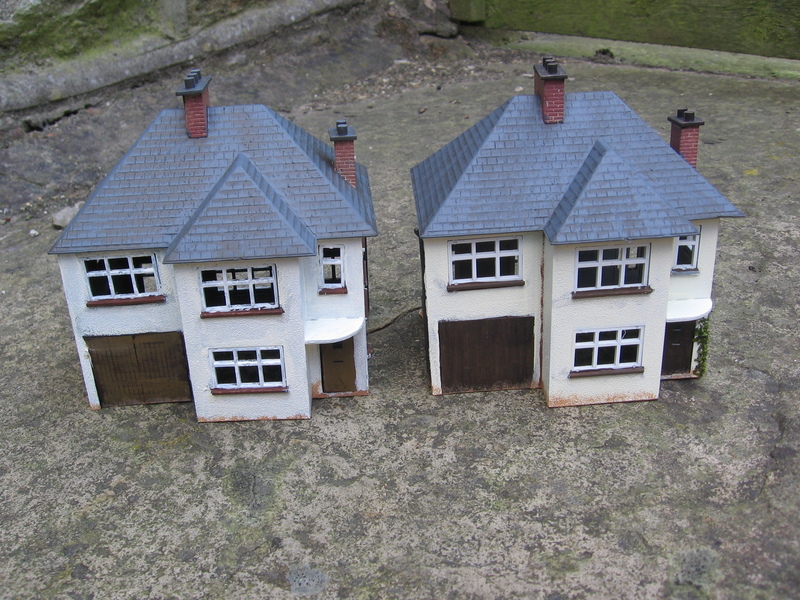 Sewers from Ainsty Castings, a AA gun and field kitchen from Sgts Mess, 6 really nice hills from Kallistra made from a good tough plastic and finally some Tumbling Dice 1/600th aircraft for Vietnam. I’m a big fan of the mini aircraft- a kind of affordable megalomania. I acquired 1 B52 (still huge even in 1/600), 4 F111s and 12 F105s- this way I’ll be able to add them to my existing collection to game strategic raids into North Vietnam. I also picked up a few bits for Evan, so I’ll look forward to seeing them appear in future games. It was nice to have the time over the weekend to chat to various people putting on game. 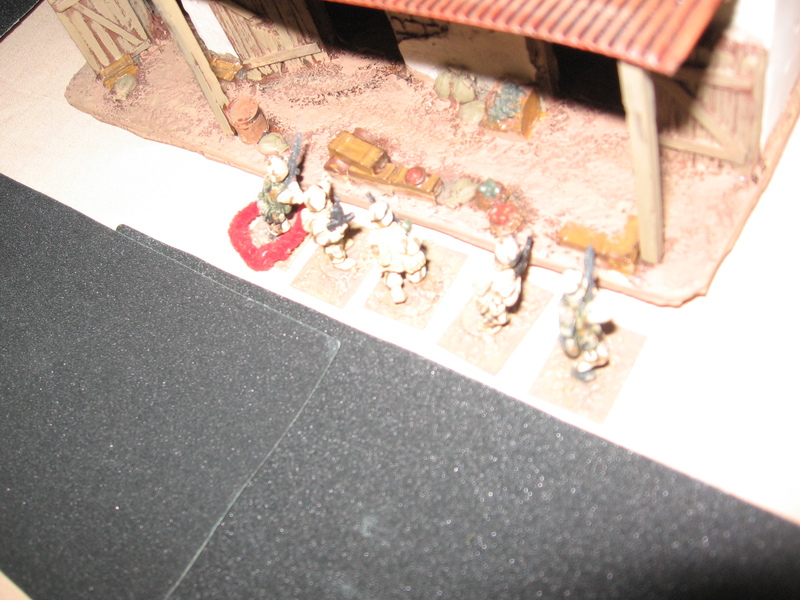 I chjatted to Will at the Lance and Longbow Society game stand- love figures and table but not my period at all. I said hello to Steve and the other lads from Barnsley who did a lovely Sicily game, and got a well deserved 2nd place for it. Had a nice chat to the Abbey Wood Irregulars with their display game- Nicaragua versus Honduras in 1957. 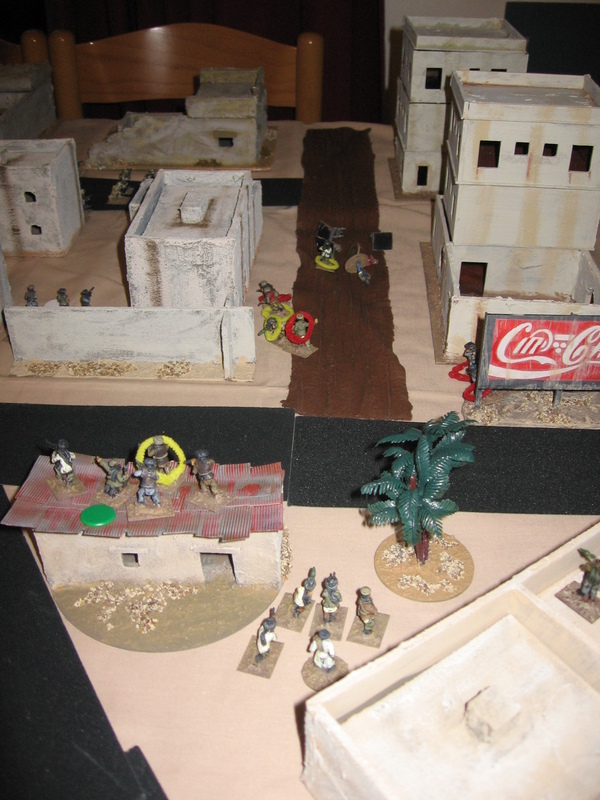 I’m always keen on obscure little war and their gaming potential- they were running the air war on a small table with the ground campaign on the main table. both games featured some very nicely painted Mustangs and Lightnings. I came away with some book suggestions- 1 is on order currently from the US. sticking with aircraft- there was a nice San Carlos bay Falklands game. The ships were all from the old Airfix lines being protected/ attacked by 1/300th planes all on a hex map. I also had a game of ‘Barbarossa in 20 mins’ put on by the Wargames Developments group. It was umpired by Tim Gow (Megablitz and More blog) it was nice to meet him and put a face to a name. I commanded Army group North- a a pretty abysmal commander I was too. After 16 mins Moscow had fallen to Army group Centre whilst I hadn’t even made it out of the Baltic… not a very good game. Still it was fast paced fun with a clever card driven system. All in all a great hobby weekend. This Monday’s game night I umpired a game of Force on Force for Bill (Boss of Under Fire Miniatures) and Brian (Brush Wars blog). 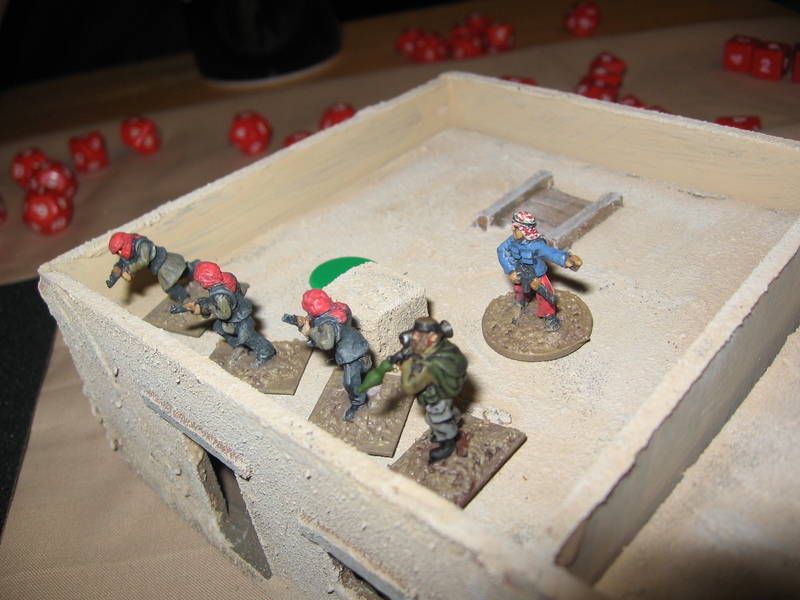 As we’ve not had many games with the rules I decided to run the first scenario from the main rule book: ‘ A Few Blocks of Hell’ as a good way to get into the swing of infantry combat. The board as seen from the US start line. 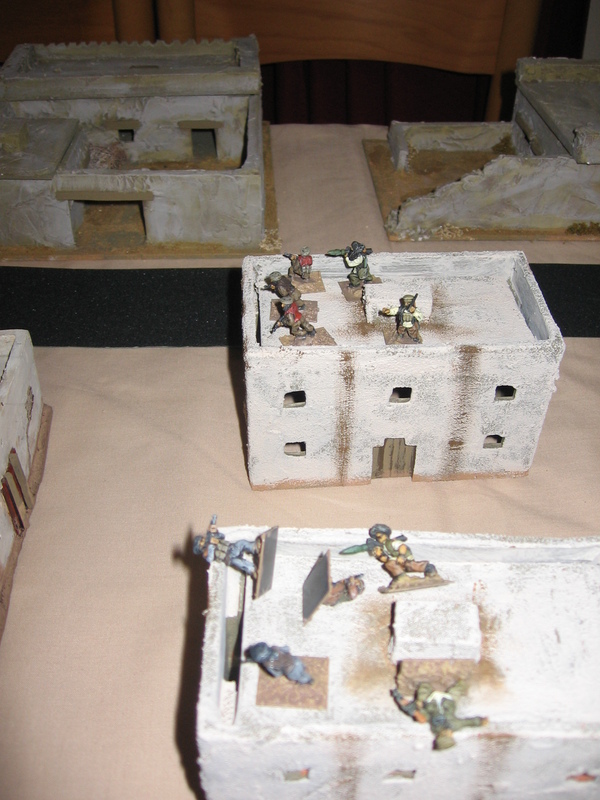 Their objective was to take the two tall buildings on the back row. The game was an interesting one- it went very much in the favour of the US (commanded by Bill) his superior Troop Quality to best effect. However a couple of bad rolls and a redeployment from Brian’s insurgents changed all that. The scenery is a mix of my own scratchbuilds with a few resins as well. The US figures are all from Britannia while the insurgents are a mix of all sort with Liberation and Britannia predominating. The US fireteams move up. Bill’s left flanking maneuver reaps early rewards. Brian consolidates his two teams that had taken casualties. A team of Syrian jhiadists on overwatch- soon to play a critical part in the game. Brian takes more hits as the US continue to advance. 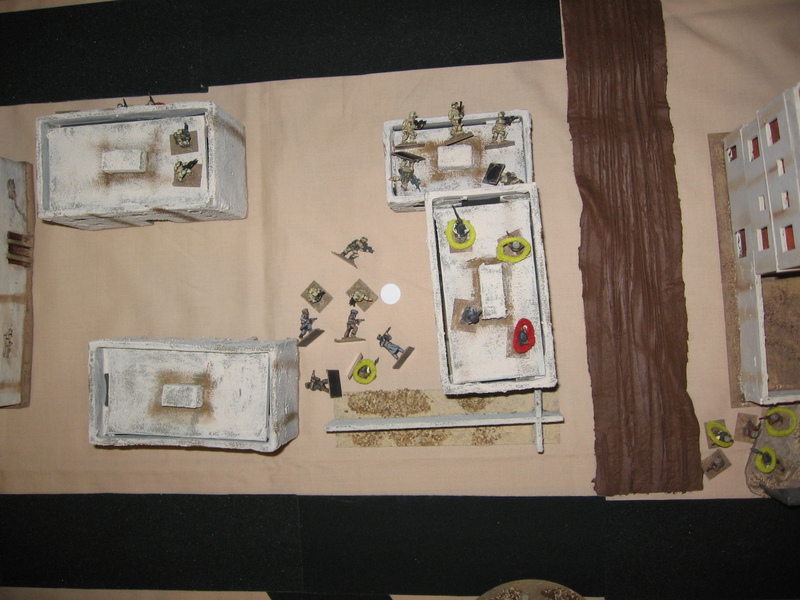 At this point in the game Brian made the decision to move his best units (Syrians) from the US right of the table to the center; this proved to be critical in stopping the US advance. 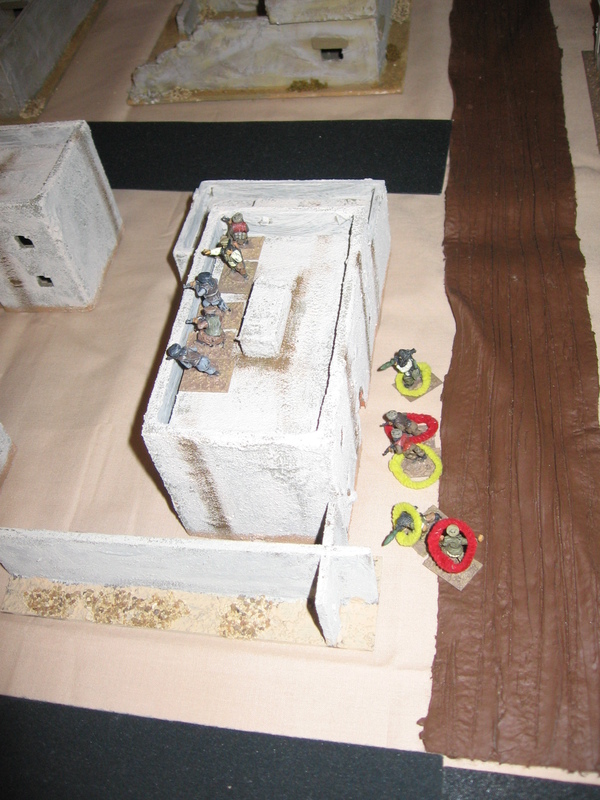 The firefight goes back and forth, but the superior numbers of the insurgents seems to carry it. A rather messy end to the game- lots of close in action and everyone try desperatly to take each other captive. Sadly the insurgents dragged off 5 wounded Americans- a black day for the US army…. All in all a really good game- swung back and forth. All three of us had a better grasp of the rules by the games end. Next time I think I’ll move theaters to Chechnya as my Russians haven’t been on the table for a while. Also I’ve a few ideas regarding reinforcements that I want to try out.